The US Navy is planning to increase training exercises off the Southern California coast, including sonar and explosives training. That’s raising concerns for whales and marine mammals on the entire coast including gray, humpback and blue whales. Sonar is known to disturb whales and can harm their hearing, a danger in an environment where sound is dominant. Sound travels four times faster underwater than it does in air, making it a powerful communication tool. “The physical environment of the ocean really favors the use of sound and the animals have evolved accordingly,” said Brandon Southall, a marine scientist affiliated with the University of California-Santa Cruz. For the last few years, he’s been recording whales off California. 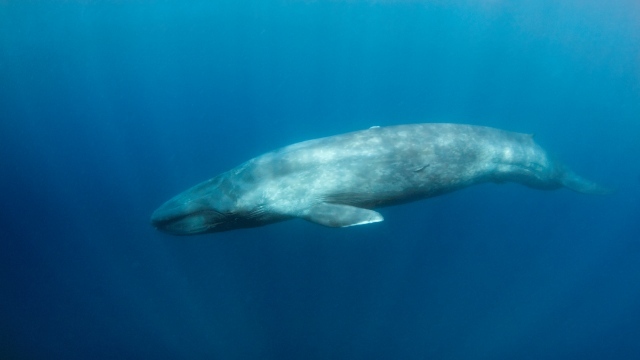 Blue whales use deep rumblings, almost too low for humans to hear. “Some of these low-frequency sounds can be picked up hundreds of miles away from where the animals are,” said Southall. Other dolphins and whales use sound to locate objects in the water through echolocation. It’s a key tool for deep-diving beaked whales, a family of rarely seen and little-understood whales found off the coast. “There’s a pattern of clicking that’s almost like a searchlight, where they’re flashing this strobe of sound,” Southall said. Navy sonar technology is based on the same idea, but the sounds can be four times louder than a whale call, loud enough to actually harm whales and in rare cases, kill them. That happened with a group of beaked whales in the Bahamas in 2000. “There were training exercises, military sonar training exercises, and shortly thereafter, an atypical number of animals washed up dead on the beach,” said Southall. Southall studies the effects of sonar, work that’s funded in part by the US Navy. Most commonly, sonar disrupts marine mammal behavior – sometimes behavior that’s crucial to survival. Southall and his team have seen blue whales and beaked whales stop feeding because of sonar. “We absolutely share the concern about protecting marine mammals,” said Alex Stone, an environmental program manager with the Navy’s Pacific Fleet. The fleet has done sonar training off Southern California and Hawaii for years. Beginning next year, commanders are looking to increase it. “A training scenario may involve two or three Navy destroyers out looking for a submarine,” said Stone. The threat of submarine warfare decreased after the end of the Cold War, “but that trend has absolutely reversed and there’s been a proliferation of these very quiet, inexpensive diesel-electric submarines that a lot of countries have now,” including North Korea, explained Stone. According to the Navy’s analysis, the sonar-training program could affect the behavior of whales, dolphins and marine mammals millions of times over five years. Stone says there are lookouts on board Navy ships that stop training runs if whales are spotted. Jasny says the Navy should avoid key areas, like gray whale migration routes and the summer feeding grounds of endangered blue and fin whales. The state of California came to the same conclusion in a review of the Navy’s plan. At a March meeting, the California Coastal Commission staff recommended the Navy stay out of sensitive areas. “We rely on this large area and when you start to segment it in little areas where – you can go here, can’t go there – it really affects the training realism,” Stone responded. Five years ago, California made the same request, but the Navy went ahead with the training anyway, citing national security concerns. The Coastal Commission sued and lost. This time, state officials didn’t mince words, like Commissioner Jana Zimmer. “We’ve got this stumbling block of the Navy being completely unwilling – completely unwilling to accept any of the mitigations,” Zimmer said. The Navy is also seeking approval from federal wildlife officials with the National Marine Fisheries Service. The agency is expected to make a decision later this year. OK, well then, so does about 50 other nations. But here we are, sending bombers and fighters over Korea, provoking Jong into a rage. Perhaps diplomacy could save us some whales? Joey, how do you reason with a madman? You don’t, a show of willingness to aide our allies in the region is a deterrent. Show me citations that 33.5 million whales being killed because of sonar, that would be interesting (and I suspect it doesn’t exist). I will let everyone know that the the navy has whale migration routes marked and does not use active sonar in those areas. I do see the point of the navy that for this training area 2-3 surface ships and a sub can’t have 15 boxes in the training area they are allowed to go active in and others they are not allowed to. It would be a waste of time. And Joey, they mention North Korea because they are the threat right now. Most countries with subs are allies, but more and more are buying or building them. It is a very real threat. the link is to an entire website, no citation found.